Indian food is like classical music raga - it takes time to build up to a crescendo. … Shobhaa De, Indian Model and Author. 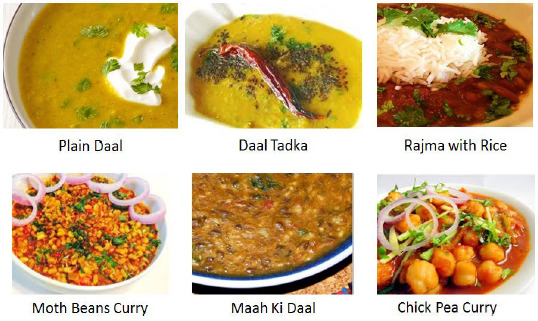 Indian cuisine boasts about the widest variety of tastes, exotic aromas, and preparation methods. Being a country of diverse culture, the taste and preparation of food changes every few hundred kilometers along with the language dialects. North Indian food is completely different in terms of look, flavor, and taste from South Indian food. Similarly, East-Indian food is totally different in its form than the food from West-Indian lands. 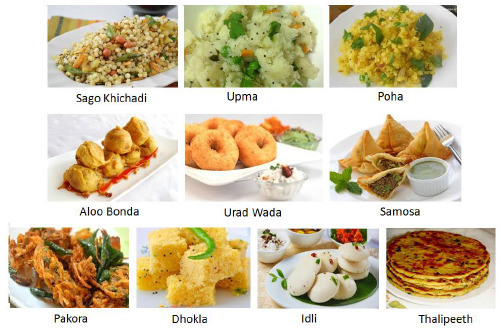 Indian cuisine is recognized as part of different regions such as Asamese, Andhrite, Bengali, Gujrati, Kashmiri, Marathi, Punjabi, South Indian, and many more. There are some special ingredients that an Indian kitchen stocks. The stock includes some gourmet dairy products such as Ghee and Paneer. These two dairy products are used in preparing sweets as well as savory dishes. Accumulate 8 parts of full cream of milk in a large deep pan. Add 2 parts of thick sour curds and mix well and keep aside for 4 to 5 hours. When the entire cream turns sour, beat it with the electric beater for around 20 minutes using water as required. This action separates butter and white buttermilk. The buttermilk is used in preparing a savory dish called Kadhi. It can be consumed as an appetizer too. Take out butter in a heavy bottom pan. Heat it on low flame till you get to see brownish golden burnt milk solids deposited at the bottom of the pan and a transparent golden ghee on the top of it. 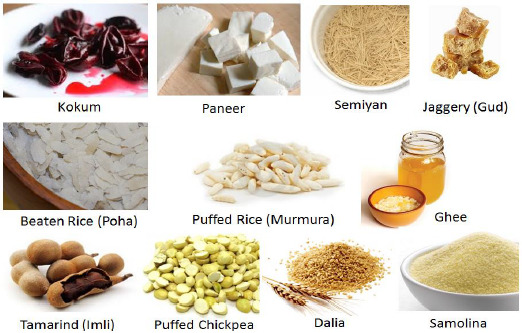 This is a basic ingredient of Paneer based gravies and desserts. Boil 2 liters milk in a deep pan. When it is coming to full boil, add 2 to 3 tbsp vinegar into it. Stir for a while occasionally. Boil for a few minutes further till you get to see milk chunks separated from thin white whey. Place a clean cotton cloth with edges spread outwards in another deep pan. Put water separated milk solids into the cloth. Assemble the edges of cloth to drain the whey completely and you get Paneer. Cut into pieces of desired shape and store in the freezer. Dalia − Coarsely broken wheat. It is used to prepare a porridge-like snack. Semolina (Suji) − Finely broken wheat. It is used to prepare Halwa or Upma. Beaten Rice (Poha) − Dry, flat, flaky rice used in preparing various snacks. Puffed Rice (Murmura) − It is roasted rice in special kiln to make it puffed. It is used to make a spicy snack called Chiwda. Jaggery (Gud) − thick boiled and solidified pulp of sugarcane juice. It is added in lentils and veg dishes to balance hot and sour taste. Vermicelli (Semiyan) Long and thin spaghetti made of wheat flour. They are used for cooking a dessert named kheer and a snack named Upma. Kokum − They are the dried peels of a fruit from a plant belonging to Mangosteen family. They leave dark red juice when soaked in warm water. This juice is used in preparation of seafood gravies, and a spicy savory chilled drink named Solkadhi. Kokum gives sour taste to the food and can be replaced by Aamchur or Tamarind Pulp. Tamarind − It is a pod-like, flat, long, and pulpy fruit with greenish brown shell as thick as egg shell. Inside, there is a brown fruit held with ridges. Both raw and ripe tamarind is used in chutneys and gravies. Puffed Split Chick Peas (Chana) − Chick peas are roasted to make them puffed and they are shelled. These puffed peas are used in preparing snacks like Chiwda, toffees like Chikki, and chutneys. Chhonk (popularly known as Tadka) is a cooking method by which aroma of various spices extracted and incorporated in the food. Five main ingredients are put in chhonk by heating oil in a pan: Mustard seeds, cumin seeds, asafoetida, turmeric powder, and curry leaves. Sometimes finely chopped green chili or garlic, juliennes of ginger, ginger-garlic paste, fennel seeds, or red chili powder, is added to release their aroma. These ingredients can vary according to the cuisine. The chhonk not only adds aroma of spices to the food but also acts as a hunger inducing medium. Indian cookery offers a very wide variety of stews preparation. The vegetable stews are made of diced vegetables. The vegetables are cooked by combining them with various spice mixes. For thickening the stew, either grated coconut, peanut, tomato, or onion pastes are used. Then they are seasoned with chhonk. The stews are popularly known as Sabzi. Fried Okra (Bhindi Fry), Stuffed Okra with filling of coconut and peanut powders and spices. The non-veg stews are made of diced meat pieces such as chicken, lamb, prawns, fish, and mutton cooked with spices. For thickening the stew, either grated coconut, tomato, raw papaya or onion pastes are used. Indian Daals are nothing but the lentils, pulses or beans cooked with aromatic spices. The lentils can be whole or split, with or without husk. If the whole lentils are to be used, they are soaked for six to eight hours if they are whole and with husk. Sometimes they are sprouted to reduce the amount of sugar in the lentil. They are cooked in a pressure cooker to make them soft, edible, and bring down their anti-digestion properties. Once cooked, spices are added and Chhonk is put over it to enhance the flavor. Let us take a look at some of the famous Daals. It is often made of split and husked Toor or Moong lentils. The lentils are washed and soaked in water for 20 minutes. Then they are cooked in a cooker till they turn completely soft but intact in shape. They are then boiled with water, little salt and ghee. Plain Daal is consumed without Chhonk. It is the plain Daal with Chhonk. The Daal is often cooked with chopped tomatoes and/or onions, garlic, ginger and other spices such as coriander powder, turmeric powder, and chilies. The Chhonk of ghee/butter with spices is put over cooked daal it to bring out best flavor. In Maharashtra state, they add some Kala (Goda) Masala into Daal while it boils for enhancing its flavor. It is prepared by cooking kidney beans. It is often paired with plain rice. Kidney beams 200gm soaked in water overnight, 1 large onion, 1 green chili, and 3 tomatoes finely chopped, 1 inch ginger and 6 cloves of garlic minced, 1 tbsp. Rajmaah Masala, 1 tsp cumin seeds, ½ tsp red chili powder, ½ tsp turmeric powder, water 600ml, 1 tbsp butter, ½ tbsp. dry mango powder, and salt to taste. Add Rajmah in pressure cooker with chopped onions, tomatoes, ginger, garlic and green chilies. Add cumin seeds, chili powder, turmeric, and water. Stir well and cook for 8 to 10 whistles. Take out from the cooker and check if it is cooked completely. Heat butter in a pan. Add cooked Rajmaah to it. Add little water, Rajmaah masala, and dry mango powder. Cook for another 6-8 minutes. Mash a few rajma beans with the back of a spoon to thicken the consistency of daal. It is prepared similar to Rajmaah using cooked chick peas instead of kidney beans. In addition, Rajmaah Masala is replaced with other tangy spice mix called Chana Masala. In India, field beans, moth beans, green beans, black-eyed beans and horse beans are often sprouted and cooked with grated coconut, chopped onion and tomatoes, and ginger-garlic paste. Indian flatbreads form a major part of the main course. They are prepared from the dough of wheat flour, gram flour, or all-purpose flour. The doughs are gently rolled on a smooth platform using a rolling pin to get them in the form of flat thin disks. These disks are generally termed as Rotis. The Rotis are baked on a flat pan or skillet called Tawa. 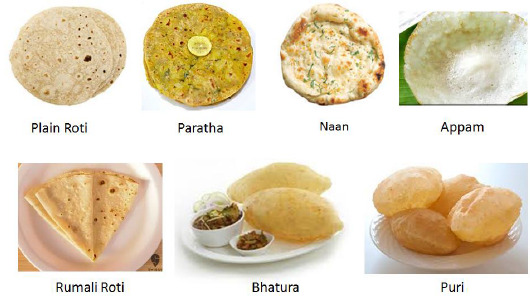 There are myriad types of Indian flatbreads when it comes to the composition of ingredients and method of preparation. This is a flatbread prepared in most regions of India. It is prepared using wheat flour dough, little oil, and some salt for taste. 2 cups whole wheat flour, ½ tbsp. salt, 2 tbsp. oil, ½ tea spoon salt, water. Mix the flour and salt and knead it into a fine dough using water and oil. Roll each dough into the shape of flat disks. Bake them on both sides on a heated Tawa. In large food preparation units, kneading and rolling equipment as well as automatic roti making machines are used that prepare ready to eat Rotis. This is a very thin roti eaten with stews and lentils. The name comes from its thin form and way of folding, similar to a handkerchief. Same as plain roti ingredients; with 1 cup whole wheat flour replaced by 1 cup all-purpose flour. Plus 4 tbsp Ghee. Divide the dough into 16 equal portions. Roll two small doughs into the shape of small flat disks. Apply ghee or oil on one of them. Place the second rolled disk on the first one. Without sealing edges, roll them together into large flat and thin disk. When each side is baked properly, separate the two layers and fold them as a fold of a handkerchief. It is cooked by stuffing some cooked dry vegetables little mashed and spiced in the dough and rolling into thick disk. For dough, same as roti. Plus any dry stuffing made by cooked vegetables. It can be made of cooked potatoes, cauliflower, cottage cheese, or any other vegetable of choice and imagination. Prepare dough by following first two steps of Roti. Roll it into 3 inch diameter disk. Place a small serving of the stuffing on it and bring the edge of the disk together and seal them to make a ball. Flatten it slightly. Apply some flour and roll it gently. Bake it on both sides using ghee or butter. 2 cups wheat flour, 1 teaspoon sugar, ½ tbsp. salt, water and oil for deep frying. Dissolve sugar in ½ cup water. Add this water and salt into the flour. Roll each piece into small disk of 4 inches diameter. Heat oil in a deep thick-bottomed pan. Deep-fry the Puris on both sides. They should come out puffy and crispy. All-purpose flour 2 cups, Dry yeast 1 teaspoon, warm water and buttermilk - 1 small cup each, sugar and salt – 1 teaspoon each, ghee or butter for butter naan. Add sugar to the warm water. Activate yeast by adding it into this mixture and let it stand for 10 minutes. Pour this mixture into the flour. Knead into a very soft dough and let it stand in warm place for 20 minutes. Make 8 equal portions of the dough. Take a small dough and roll it into 3 inch diameter round disk. Spread little ghee or butter. Fold the disk half. Apply ghee again on the visible surface and fold it to bring a look of a circle’s quarter. Roll it into flat little thick disk, which should resemble a triangle with rounded corners. Bake it on both sides till half done. Place it on the wire rack and hold the rack directly on the flame. Turn the naan and let it bake on the other side till done completely. The naan looks thick bread with bubbly surface. Applying ghee on the top of the hot naan gives butter naan version. It tastes good with any spicy veg or non-veg gravy. It is similar to Puri in appearance but it is bigger and puffier than Puri. The dough for Bhatura is prepared using little curds, water and salt. It is consumed with spicy chick-pea gravy. This pairing is popularly known as Chana-Bhatura. They are fluffy smooth flatbread made with the rice as main ingredient. Raw rice 1 large cup, husked and halved black grams ¼ cup, fenugreek seeds 1 tbsp., coconut milk (first) 1 cup, cardamom powder 2 pinches, salt and sugar ½ tbsp. each. Soak rice, black grams and fenugreek seeds for 2 hours. Grind them together to thick consistency. Add coconut milk and mix well to form batter of pouring consistency. Keep it at warm place for 8 hours for fermentation. Add cardamom powder, sugar, and salt. Pour the batter of the size of a serving spoon in the center of the pan. Hold the handles of pan and tilt it in such a way that the batter spreads outwards and makes a circle. Make sure the center is thicker than the outer side. Cover it with lid for a couple of minutes and steam it. When the outer side starts leaving the pan, the appam is ready. Take the appam out gently by cooking it only on one side. The other versions of rice flatbreads are Dosa and Uthapam, which can be eaten as a snack in themselves. Each one use different compositions of rice and black gram, and different fermentation periods. Flatbreads taste best when hot and fresh, paired with stews, gravies, and pickles. Rice is consumed with either Daal, curds, gravy, or curry if it is plain. 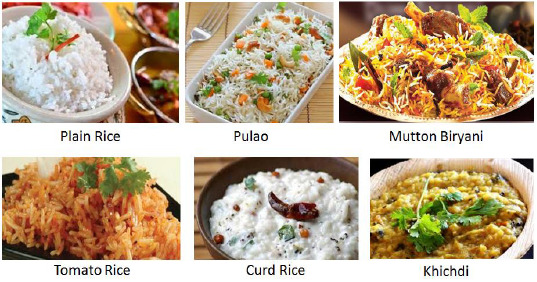 Variants like Biryani, Pulao, Curd-Rice, and Tamarind-Rice are consumed as a one dish meal. Rice is washed thoroughly and cooked with water, salt, and little ghee in a pressure cooker or electric cooker. In this section, we will discuss some of the popular rice dishes. It is boiled/steamed rice without any spices. Raw long grain rice 1 cup, water, salt ½ teaspoon, ghee 1 tbsp. (optional). Take 2 cups water in a medium saucepan. Add salt and ghee to it. Add rice and boil it for 5 minutes. Turn down the heat and cook for 15 minutes with lid on. Let it stand for 5 minutes with lid. The grains should be finely cooked yet separate. This is spicy rice cooked in veg or non veg stock and pieces of vegetables or meat. Long grain rice 1 ½ cup, Green Peas ¼ cup, Dices carrot ¼ cup, Any other diced vegetable of choice, Bay leaf 1 piece, Garam Masala Powder ½ tbsp., Turmeric and Red Chili Powders, Mustard Seeds and Cumin Seeds ½ tbsp. each, Asafoetida a pinch for chhonk, chopped coriander leaves 1 bunch, salt ½ tbsp., oil 2 tbsp., vegetable stock 2 ½ cups. Wash rice and keep aside. In a heavy bottom pan, add oil. When it is heated, add Mustard Seeds, Cumin Seeds, Asafoetida, and Turmeric Powder. Add vegetables and red chili powder and stir for a couple of minutes. Add rice, stock, and salt. Bring to boil on full heat. Reduce heat and cook rice for 15 minutes. Cut the heat and let it stand for 5 minutes with lid. Meat pulao is made of replacing pieces of vegetables with pieces of boneless meat and meat masala. Khichdi is rice cooked with mainly lentils and chopped carrot. The split green grams or pigeon peas are used as accompanying lentils with rice. This one dish meal is light on spices and always seasoned with ghee. For Rice − Star Anise 1, washed & drained basmati rice 500 gm, Bay Leaves 2, Black Cardamoms 2, Black Cumin Seeds 2 tbsp., Black Peppercorns 6, Green Cardamoms 6, cinnamon sticks 1”X2, Cloves 6, Fennel Seeds 1 tbsp., Nutmeg ¼ Piece, Mace 1 flower, Salt 2 tbsp. For Mutton Marination − Mutton 1 kg cut in 2 inches pieces, Garam Masala 1 tbsp.,1 Ginger-Garlic Paste 2 tbsp., Raw Papaya Paste 3 tbsp., Hung Curds 6 tbsp., Juice of 1lemon, Red Chili Powder 1 tbsp., salt 1 tbsp. Saffron strands 2 pinches soaked in ½ cup milk. Other ingredients − Thinly sliced onions 4 fried till brown, Chopped tomatoes 2, 4 tbsp ghee. Oil, Rose Water, Kewra essence 6 drops. Mix all ingredients for margination and keep standing for 1 hour. Cook the marinated mutton over medium heat by stirring in between till it is soft and intact. Soak the rice for 20 minutes in water. Wash well and drain. In a small piece of clean cloth take Black Cardamoms, Black Cumin Seeds, Black Peppercorns, Green Cardamoms, cinnamon sticks, Cloves, Fennel Seeds, Nutmeg, Mace, and tie a knot to make a small bag. Bring around 800 ml water to boil. Add rice, bay leaf, salt, and spice-bag into it. Cover and cook until the rice is half done. Drain the water and remove the whole masala bag. Add Kewra essence and rose water into saffron-milk mixture. Heat a heavy bottom pan on medium heat. Add ghee and bay leaf. Add a layer of cooked rice, top with cooked meat pieces, sprinkle some saffron water, top with fried onion slices and ghee. Repeat till ingredients are over. Put the lid on the pan. Seal the pan using flour dough or foil. Cook the Biryani on low heat for 30 minutes. The difference between Pulao and Biryani is, the Biryani is layered while being cooked, uses exotic spices such as saffron, and has a traditional gourmet cooking style unlike pulao. South Indian communities prefer some simpler and tangy rice dishes such as lemon rice, curd rice, tomato rice, and tamarind rice. These rice versions are often prepared using roasted peanuts, split black gram and yellow gram powder, and a Chhonk of curry leaves, asafoetida, and turmeric. Alloo Bonda− It is prepared by molding spiced and mashed boiled potatoes into rounds, coating them the batter of gram flour, and deep frying them till golden brown. Idli − It is made with the batter of rice and black gram. Two parts of rice and one part of split husked black gram is soaked for eight hours. They are ground separately in a pouring thick consistency and mixed well together. This batter is kept at warm place for fermentation for around 6 to 8 hours. The batter is set into Idli molds and steamed for 15 minutes. Poha − It is made of beaten rice. The beaten rice is washed and all water is drained. It becomes wet and soft. Some oil is heated in a pan and mustard seeds, cumin seeds, asafoetida, turmeric, green chili pieces, and curry leaves are added to it. Peanuts and chopped onion and finely chopped potatoes are added too. After cooking this mixture, the soaked beaten rice is added and mixed well. It is cooked for a few minutes. Finally, salt, a pinchful of sugar, and fresh grated coconut is added to bring tangy taste. Sago Khichadi − The sago is soaked for nearly 2 hours. Ghee is heated in a heavy bottom pan. The cumin seeds and a few pieces of green chilis are added to the ghee. Then pieces of potato are added and fried for a little while. The soaked sago is added alongwith coarsely ground powder of roasted peanuts. The mixture is cooked for a while with lid; stirring occasionally. Finally, some salt and a pinchful of sugar is added. Pakoda (Fritters) − They are prepared by missing onion or potato slices in gram flour with red chili powder, salt, and carom seeds. They are then deep fried till they turn golden brown and served with chutneys. Samosa − It is prepared by stuffing spicy mixed vegetable into stripes of dough, folding them in a triangular shape, and finally deep frying them. The vegetable involves roughly mashed boiled potato and green peas spiced with turmeric and pieces of green chili, fennel seeds, corn nibbles, raisins, and broken cashew nuts. Thalipeeth − It is made of five grain flour. The split chick-peas, rice, wheat, green gram, dry red chilies, and coriander seeds, are roasted. These all ingredients are ground to fine power. At the time of preparation, the flour is kneaded using water and salt into fine soft dough. Some chopped onion and cilantro is added. Some oil is applied to the surface of a skillet and a dough is gently spread into a round disk by pressing it with hand. Finally, the skillet is transferred to heat and the Thalipeeth is cooked on both sides with lid. Upma − Its basic ingredient is broken wheat called dalia or coarsely ground wheat called suji. Regular chhonk is prepared in a pan and some chopped onions, green chili, peanuts, split chick peas, and tomatoes are fried in it. The dalia or suji, salt, and some ginger juliennes is added and stirred for a while. Finally, Boiled hot water is added and the mixture is covered immediately to cook thoroughly. Dhokla − Its main ingredient is gram flour and suji. They both are combined and mixed well with ginger-garlic paste, green chilli paste, sugar, thin buttermilk and salt. The mixture is fermented for six to eight hours. The batter of thick pouring consistency is then steamed for 10-12 minutes. The dhokla is cut into pieces and seasoned with a chhonk of mustard seeds, cumin seeds, and curry leaves. Urad Vada − The main ingredient is black gram. The split and husked black gram is soaked for two hours. It is ground coarsely to thick consistency. Chopped fresh coconut green chilli pieces, and salt is added to taste. The wadas are made with hand making hole at the center and deep fried till they turn golden brown on both sides. Vadi − They are small bite size spicy and tangy rolls cut into disks and fried till crispy. Bakhar Vadi − A mixture of dry roasted coconut, red chili powder, poppy seeds, sesame seeds, chopped fried cilantro, salt, and tamarind pulp is cooked. A mixture of all-purpose flour, corn flour, baking powder, and carom seeds is kneaded into fine dough. A small portion of dough is rolled into a flat disk and the cooked mixture is evenly spread on the top of the disk. It is then rolled and cut into pieces. These pieces are deep fried in oil. Alu Vadi − It is made of arum leaves. A mixture of gram flour, carom and sesame seeds, red chili powder, salt, and tamarind pulp is applied evenly on the back of the arum leaves. The leaves are then folded into tight roll. This roll is steamed for 10 to 12 minutes, cut into pieces, and shallow fried. Kothimbir Vadi − A thick mixture of chopped coriander, chick pea flour, ginger-garlic-green chili paste, salt, and carom and sesame seeds is shaped into a long roll. The roll is steamed for 10 to 12 minutes. It is cut into pieces and sallow fried. 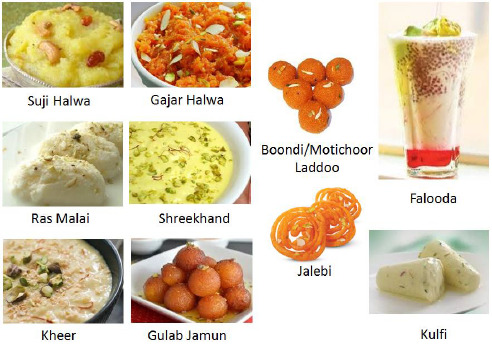 Indian desserts are part of main course though in many regions now dessert is being treated as a course after main course. The desserts prepared in pure ghee are considered the best in taste and appearance. Falooda − It is a popular sweet made of cooked vermicelli, rose or khus syrup, chilled milk, and basil seeds. Gajar Halwaa − It is prepared by cooking shredded carrots in milk with sugar, broken cashew nuts and almonds, raisins, and cardamom. Gulab Jamun − They are round sweetmeats in sugar syrup. All-purpose flour, milk powder, and baking powder are mixed together and kneaded into fine tight dough. It is divided into small round doughs of 1 inch diameter. These small doughs are deep fried till golden brown. Once they cool, they are added into cardamom-flavored sugar syrup and kept aside till they soak the syrup. After a couple of hours, Gulab Jamuns turn soft, swollen, and edible. Jalebi − Jalebis are coiled sweets dipped in sugar syrup. The mixture of all-purpose flour, Corn flour, Curds, and salt is prepared with a thick consistency and fermented for eight hours. It is then filled in a piping bag with 5mm diameter nozzle. Oil is heated in a deep frying pan and the jalebis are prepared directly into heated oil by pouring the batter into oil in the pattern of coil. They are fried till done and put into the sugar syrup. Kulfi − It is a traditional ice cream of Indian subcontinent mostly sought after during summer. It is made of freezing the mixture of thick evaporated milk, sugar, crushed almonds and pistachios, and saffron. Motichoor Laddoo − It is a sweet and flavorful ball-shaped dessert made of Boondi, the fried chick pea flour with pearl shape. To start with, the batter of gram flour with thick flowing consistency is prepared. It is then directly fried into hot oil in the form of small drops when passed through a circle-slotted spoon. Once the Boondi is fried, it is put into sugar syrup and kept for some time. Shelled watermelon seeds, raisins, and cashew nuts are added into this mixture and laddoos are prepared by taking three tbsp. portion of the mixture in hands and shaping it round. Paaysam or Kheer − It is a dish made using either vermicelli or rice, which is cooked in milk flavored with sugar, cardamom powder, saffron, coarsely cut nuts, and pure ghee. Ras Malai (Ras = Juice, Malai = Cream) − It is a flattened sweetmeat in flavorful milk. Its main ingredient is cottage cheese. Fresh cottage cheese is mashed and rolled into small balls of 2 inches diameter. They are flatten a little. They are cooked with sugar, water, and essence of Kewra or Rose for 8 to 10 minutes. They turn soft and bigger once cooked. They are put into a flavorful mixture of thick milk, cardamom powder, blanched and sliced almonds and pistachios, and saffron. This sweet is often consumed chilled. Shreekhand − The main ingredient in this dish is hung curds. Thick curd is acquired by hanging it for 3 to 4 hours in a thin cotton cloth so that most of the water is removed from it. It is then mixed with sugar, cardamom powder, one or two saffron strands, and crushed almonds and pistachio nuts. If the pulp of ripe Alphanso mangoes is mixed with Shreekhand, a very delicious sweet called Aamrakhand is prepared. Both Shreekhand and Aamrakhand are consumed chilled with Puris. Suji Halwaa − Its main ingredient is Suji, which is sauted in ghee with sugar, crushed or sliced nuts, raisins, saffron strands, and cardamom powder. Finally, the halwaa is cooked by adding hot water into this mixture. Chutneys and pickles enhance the flavor of main food by complementing it. They are thick and savory mixture of either grated coconut, roasted peanuts, mustard or sesame seeds, green chili, and salt. Chutneys are also prepared using tamarind pulp, seedless dates, and raisins by cooking them in water for some time, and adding jaggery, salt, cumin seed powder, and chili powder. The chutneys are served with main food, snacks, or street food too. Pickles are prepared by marinating the pieces of raw mango, root vegetables, garlic, raw tender turmeric, or lotus stem in salt, oil, and ground condiments. For pickles, mostly sesame, peanut, or mustard oil is used. They are served as an accompaniment with Parathas, Rotis, and rice dishes. In Southern India, they also prepare pulpy pickles by cooking local leafy vegetables with garlic, chili, tamarind, jaggery, and oil to have them with rice. A very large variety of street food includes Bhel, Pani-Puri, SPDP (Sev-Puri-Dahi-Puri), Chaat, Roles and Wraps in veg and non-veg variants, spiced corn nibbles or cobs, sandwiches, Vada-pao, Kachchi Dabeli, Ragdaa-Pattie, Bread Pakora, Kebabs, and Momos. Most of the street foods are prepared using various masalas. The street food is often served with Tamarind chutney or Dates chutney. The coconut chutney is prepared with either dry coconut or fresh coconut grinding it with garlic, green or red chili.